BEST HAMMOCK AND SUPER EASY TO PUT TOGETHER! I PURCHASED THIS FOR OUR YARD, SUPER FAST SHIPPING EVERYTHING WAS IN THE BOX, THE PRODUCT WAS PUT TOGETHER IN 10 MINUTES BY A WOMAN! SUPER NICE, HIGH QUALITY. JUST WISH THEY SOLD A COVER YOU COULD GET FOR IT. I PURCHASED A TARP TO LAY ON IT SO THE BIRDS DONT POOP ON IT ALSO VERY COMFORTABLE AND THIS HAMMOCK DOES NOT FLIP YOU! 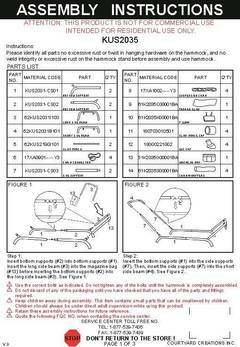 IF A PERSON CAN'T PUT THIS TOGETHER THEN THEY HAVE PROBLEMS YOU DON'T EVEN NEED ANY TOOLS! I knew i was not buying top end equipment, because of the price. i had this shipped to my house and it was real easy to put together. I liked the fact they used large diameter tubing for structural strength. I didn't spend $78 thinking I would pass this on to my kids, but it does appear that it will be around for awhile. Have waited years to indulge in a hammock and this was so worth the wait. Quality, sturdy materials with quick assembly/disassembly. I got the red and added a small umbrella for the picnic table making a perfect area in the yard. It does what a hammock is supposed to do - draws you to it and pulls you into relaxation mode. I was surprised at the quality level - it is wide and it is water repellent. With the Texas sun, have it in a shaded area of the yard and will disassemble/store in the winter to save it from harsh weather. Love it and plan to get a second one. Don't plan to put drinks or food on it, or lay on it with sun oils - place a beach towel down first to preserve it. Enjoy! Let's be honest, most hammocks are kind of an eye sore to look at. This hammock is soooo nice!! I love the blue color and it matches my patio set perfectly!! It is sturdy and comfortable and I feel confident laying in it that I'm not going to fall to the ground. Very happy!!! Would've paid over $150 for something this good!! This is an excellent 4-point anchor hammock. It is sturdy, comfortable and was easy to set up. 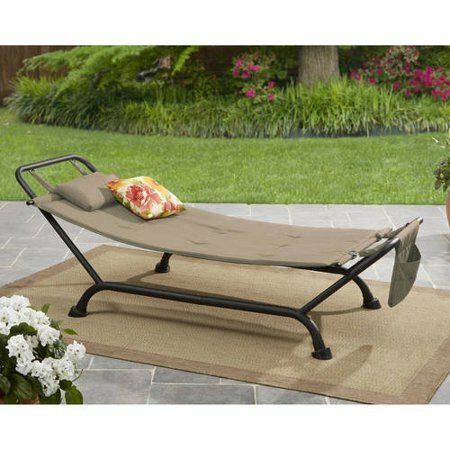 It provides a cushioned, relaxing place to lounge in the shade or to watch the stars. I will put it away when the rainy season starts, but I think it would dry quickly and it seems to be colorfast . This comfortably fits my 6'1" hubby and our child. 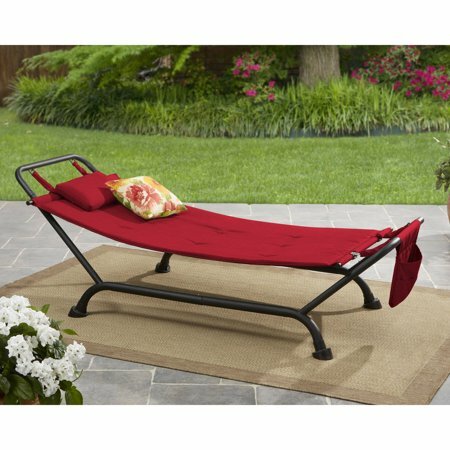 This hammock was exactly what we were looking for and the price point beat the other one of this style on the market. With proper storage we expect this hammock to last years. What is the overall length including the frame? 1. The length is 90 7/8'' for this hammock. Is there a weight limit on this hammock! 1. The weight capacity of this item is 250 lbs. What are the dimensions? How long is this hammock? 1. The dimensions are 90-7/8"L x 38-1/3"W x 32-1/8"H.